Chirp, chirp…Spring is right around the corner, at least I am hoping. 😉 Today I wanted to make a Birthday card for a dear friend and we are all at that age where we don’t like to acknowledge a number, if you get my drift…so I thought this adorable stamp set by Newton’s Nook, Newton’s Birthday Flutter was just the thing to create that card. I started by using the smooshing technique for the front background. I took some Distress Oxide Peacock Feathers and Broken China inks and rubbed a bit onto a piece of acetate then I spritzed it with water. I then “Smooshed” it onto a piece of watercolor paper. I did each color separately and dried it between layers. Next I colored the birdie and balloons with alcohol markers and fussy cut them out so I could add them to the background. I hand drew in the strings. I stamped the sentiment in Ranger Archival Black Ink. Now for the inside… I colored Newton and added some stripes with my alcohol markers, stamped the super funny punchline and sponged on some Distress Inks in Tumbled Glass and Peeled Paint…those are my two Go-To colors for grass and sky. I then ran the front portion only through my eBosser with a confetti embossing folder to add a little interest to the white card base. I mounted both the watercolor panel and the inside panel onto a mat and added them in place. 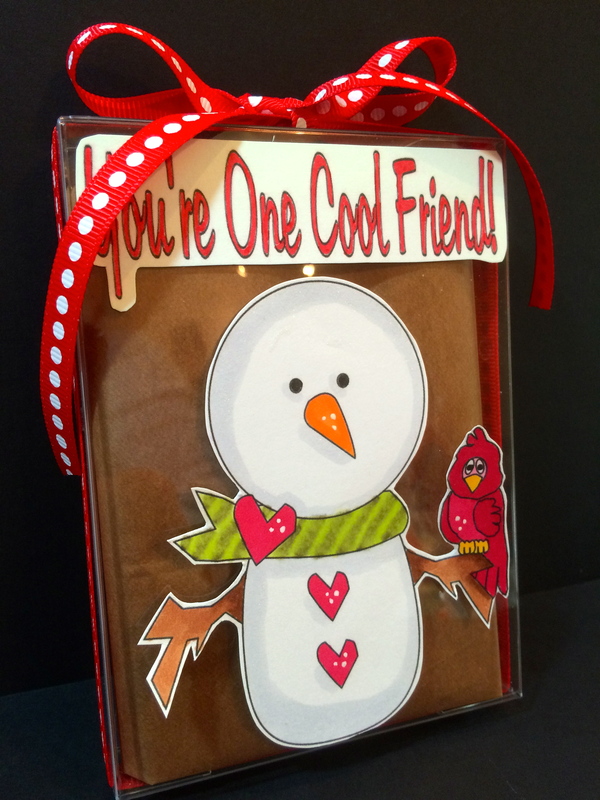 I entered my little Newton card in the 2 Crafty Critter Crazies Challenge #10. Please follow this Link to enter your own creation or to take a peek at all the inspiration! I hope you enjoyed today’s card, thank you for stopping by! Please follow our blog by clicking on the “Follow Me” button and Like us on Facebook and follow us on Instagram so you don’t miss a thing! Happy Fourth Wednesday of January! Today is the fourth installment of my Old School style Valentines. We used the whaley adorable I Whaley Love You set from Sunsational Stamps. I used my eBosser and the large wood grain embossing folder, but I ran my paper in sideways so it would look like water instead of wood. 😉 I die cut stitched circles, one in the white card base and the next size up in the blue embossed paper. I colored the whales with ShinHan alcohol markers and sponged Tumbled Glass Distress ink on the background. I added white gel pen dots to the water spouts. The final touch was to put Clear Droplets from Pretty Pink Posh and little red enamel hearts from CTMH. I hope you enjoyed today’s card. We would love it if you would follow our blog by clicking on the “Follow Me” button and Like us on Facebook. Happy Wednesday to you! Today is the second in a set of four Old-style Valentines. I used these adorable images ‘Sherry and Dog with Bone’ from Sunsational Stamps. I colored them with ShinHan alcohol markers and distressed the background with Worn Lipstick Distress Ink. I added a few die cut hearts that I cut with my fabulous eBosser. I cut the background doily with We R Memory Keepers Mini 8 Punch Rose pattern. I cut it on Beetle Black cardstock from Doodlebug. I mounted all that on the card base, and stamped the inside sentiment with CTMH Brushstrokes and January’s Stamp Of The Month Beloved Bouquet. I hope you enjoyed our card today. We would love it if you would follow our blog by clicking on the ‘follow me’ button and Like us on Facebook so you don’t miss a thing! Amorous greetings to you! With all the winter holidays behind us we look forward to the days getting longer and hopefully back to warmer temps. It is also time to start putting together some Valentines. For the month of January, on Wednesdays, we are going to put together various old school style Valentines. You know, the kind the kids hand out at school. I always loved this holiday…first of all I am all about RED and second of all I love—love. 🙂 So with no further ado, I will present the first of four Valentines that are super fun to make, and the kids just may want to get in on the creative process as well. You can find all of our Wednesday Valentines at The Sunsational Stamp Shop, so hop on over there and take a peek at all the fabulous stamps they have. While over there look around in Scrapping With Lisa’s Image Shop for digital images as well. This cutie was colored with ShinHan alcohol markers. I used an Exacto knife to cut into his paws so he could hold his little sign telling the recipient that they are loved. 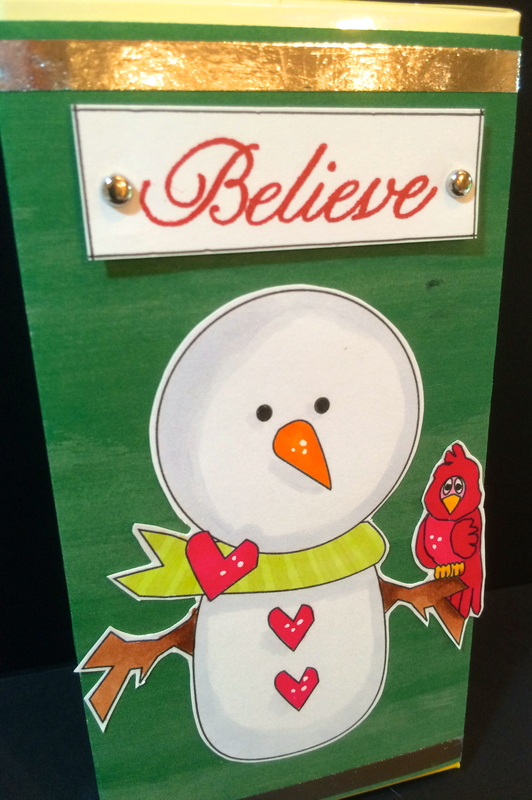 I mounted it on a piece of red cardstock that I embossed using my CTMH hearts embossing folder and my eBosser. We would love it if you would follow our blog by clicking on the ‘Follow Me’ button and Like us on Facebook so you don’t miss a thing! Gobble, Gobble! It is that time again when we reflect on our blessings and focus on what we have. Many also are generous with their blessings and are able to share with others. Today’s cards are thank you cards to a couple of people who went the extra mile for my family, so it was a perfect time to send them a little Thank You card for their thoughtfulness. 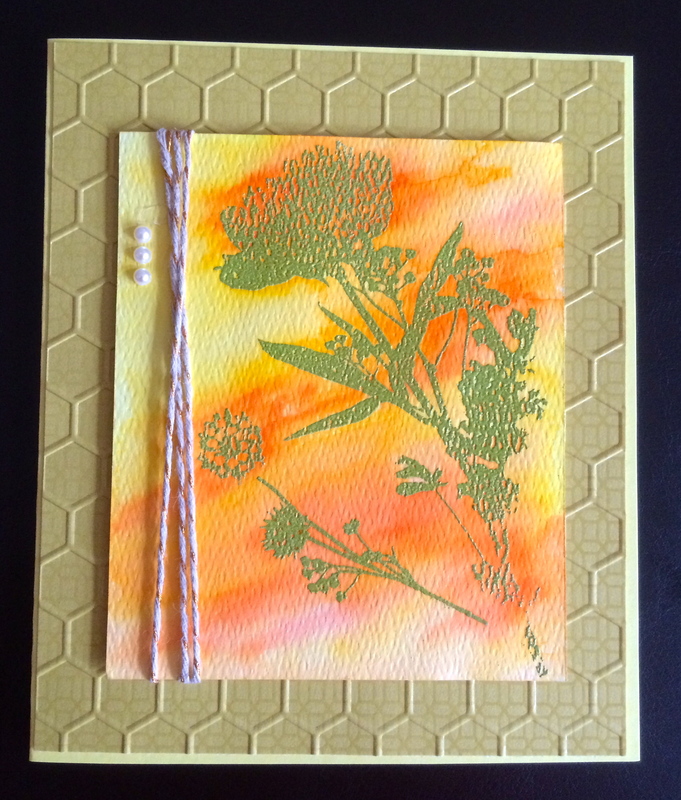 The first card was for a friend who is a retired tradesman, so I used a wood grain embossing folder and tape measure patterned paper, all tied together with CTMH Fern twine. Then for an added touch, I stenciled a paint splotch to highlight the sentiment using Tim Holtz Splatters stencil 🙂 The sentiments were stamped using Memento Cocoa Brown ink and the CTMH Finding the Words stamp set. 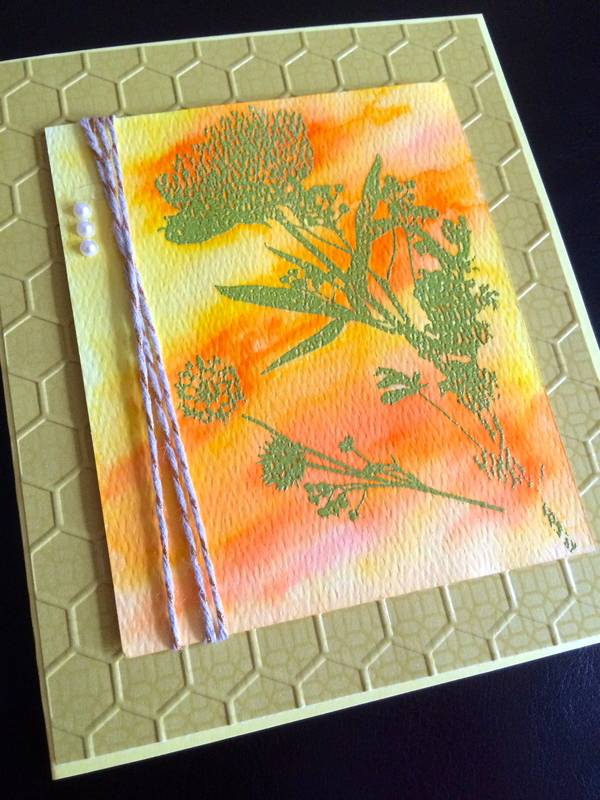 The Tim Holtz Sizzix On The Go Texture Fades embossing folder is one of my faves. 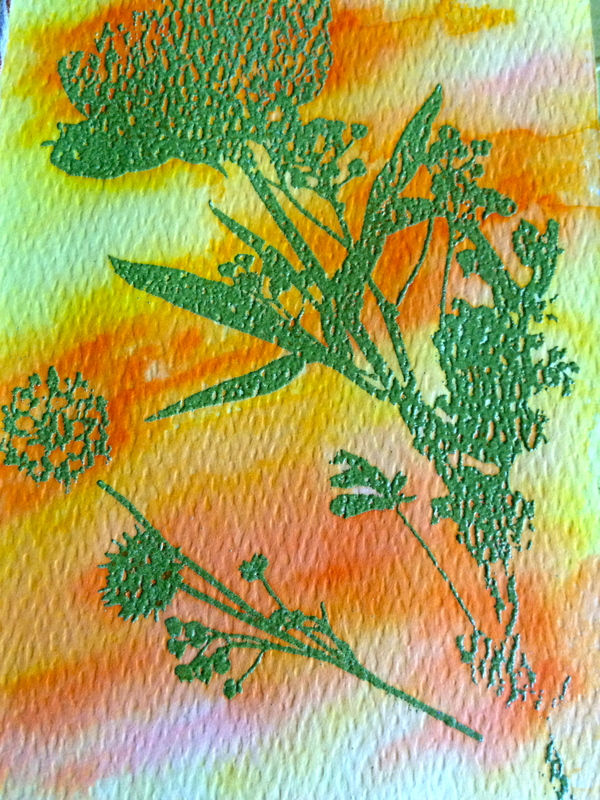 After running my kraft card stock through the eBosser I then sponged some Tea Dye Distress ink over the top, just to capture the texture. I die cute Thanks from my Lawn Fawn Lawn Cuts die, I actually did this four times so I could layer it to give it depth. I mounted it on a banner and popped the banner up over some CTMH Fern Twine. On the inside I stenciled the coffee cup rings and splashes using my Tim Holtz Splatters stencil. Oops, I almost forgot…First, I stamped the To-Go coffee cup using my CTMH Treats of Friendship, and I masked it when I stenciled the coffee stains. I colored the stamp in with Distress Markers. I would like to wish everyone a very happy and safe Thanksgiving holiday. Please click on the Follow Me button and Like us on Facebook so you don’t miss a thing. Jingle Bells and Ho, Ho, Ho to you! One of my favorite “silly” Christmas songs is I Saw Mommy Kissing Santa Claus, my all time favorite rendition is by John Mellencamp. Curtains drawn back to reveal the kiss. The background of brick was achieved by running my cardstock through my eBosser using my Tim Holtz Alterations brick embossing folder, and then I distressed it lightly with CTMH Slate ink, just to make the bricks pop a little. I layered that on top of red and green dotted patterned paper and that was added on top of green Bazzill cardstock for the base. I added a black rectangle with the top corners rounded to form the opening to the fireplace. I colored the images with Copic and ShinHan alcohol markers and popped the image up with foam tape. I added Glossy Accents to the berries in the mistletoe and “hung” it with some silver thread. The final step was to pull back the curtains with brads and attach the curtains with Scor Tape. Head on over the http://www.sunsationalstamps.com to get this (and hundreds more) great stamp sets. We would love it if you would click the “Follow Me” button to follow the blog and Like us on Facebook so you don’t miss a thing. Hello fellow crafters, I am in the process of making about four trillion holiday cards and tags…well maybe not quite that many, but let me tell you it is A LOT. So with no further adieu, here is today’s holiday card. I used You Light Me Up set/images by Sunsational Stamps. I love how “Merry & Bright” these adorable holiday lights are! I wanted to make another shaker card because they are so dang fun! This one I watercolored the background with Zig Clean Color Real Brush markers. Next I stamped the sentiment on acetate with StazOn. I sponged Evergreen Bough Distress Ink onto the little frame I die cut, then attached the acetate to the backside of the frame then on the watercolor background I made a pile of shaker elements…snowflakes, sequins and large glitter flakes by WOW. I added foam tape to the back of the frame and adhered it over the watercolor background. Then I added CTMH thick twine in Fern, making little loop-de-loops and adhering them down with Glossy Accents. I wanted it to appear like a wonky sting of lights. I printed out the bulb images then cut them out and adhered them to the frame/string. I glued all that down to a card base that I embossed with a swirly pattern. I sure hope you enjoyed todays project. Please visit http://www.sunsationalstamps.com to find this and so many other adorable holiday stamp sets and digital images. We would love it if you would like us on Facebook and click on the ‘Follow Me’ button so you don’t miss a thing! It’s a Holiday Triple Play! Welcome to Triple Play Wednesday! We are upon that time of year where crafters have to get a move-on to complete (or begin) their holiday gifts, tags, cards etc. 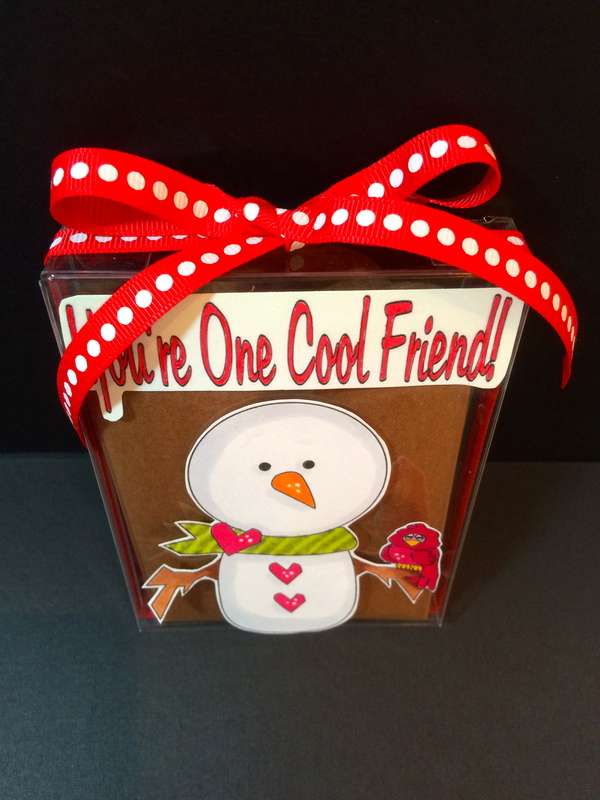 Today I am using the stamp/image set You’re One Cool Friend from Sunsational Stamps to make three different holiday items. 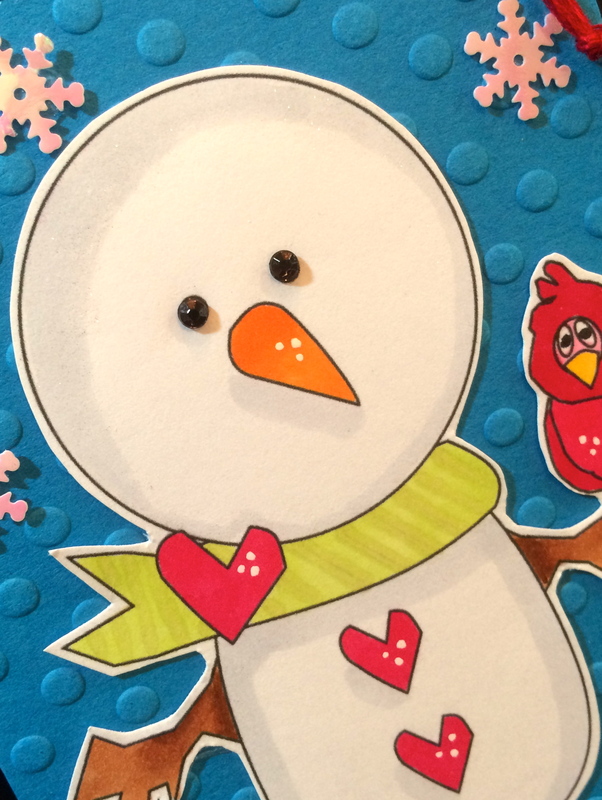 I am IN LOVE with this adorable snowman and his sidekick cardinal, I printed him out three times, colored him in with alcohol markers, added A Wink of Stella to make it glisten. I colored clear gems with a black alcohol marker to make the snowman’s eyes appear to be coal and added some random highlight dots with a white gel pen. Finally I fussy cut each one out then moved on to the packaging they were to be added to. 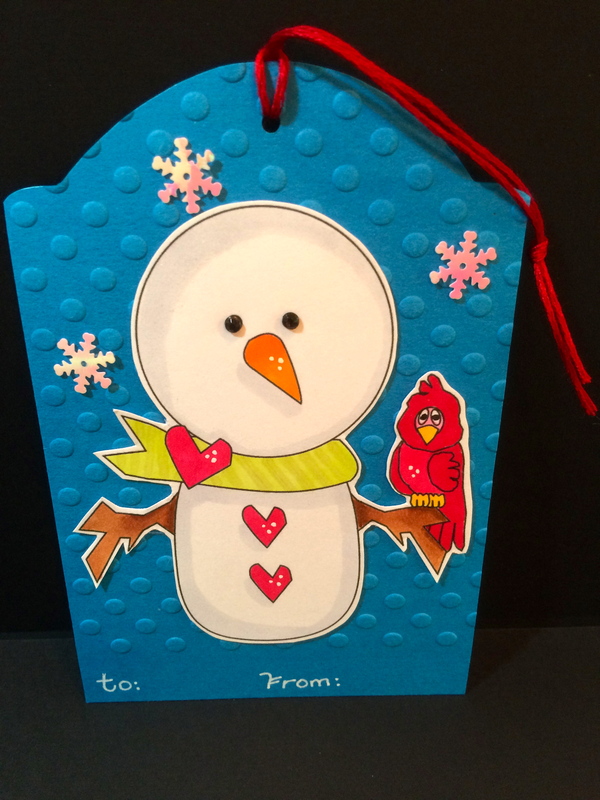 I embossed the gift tag with the polka dot embossing folder in my eBosser and added snowflake sequins for a little extra sparkle. On the candy wrapper I adhered that fabulous transfer foil that I used a few weeks ago, to do this I put Scor tape along the top and bottom and pressed the foil onto the tape to adhere, then I simply lifted the foil sheet off and voila, a beautiful strip of silver foil to accent the wrapper. The clear gift box is lined with kraft color tissue and topped off with a beautiful red ribbon and bow. Please head on over to http://www.sunsationalstamps.com to get some great inspiration from the fabulous Design Team members. Like us on Facebook and click on the Follow Me button so you don’t miss a thing!